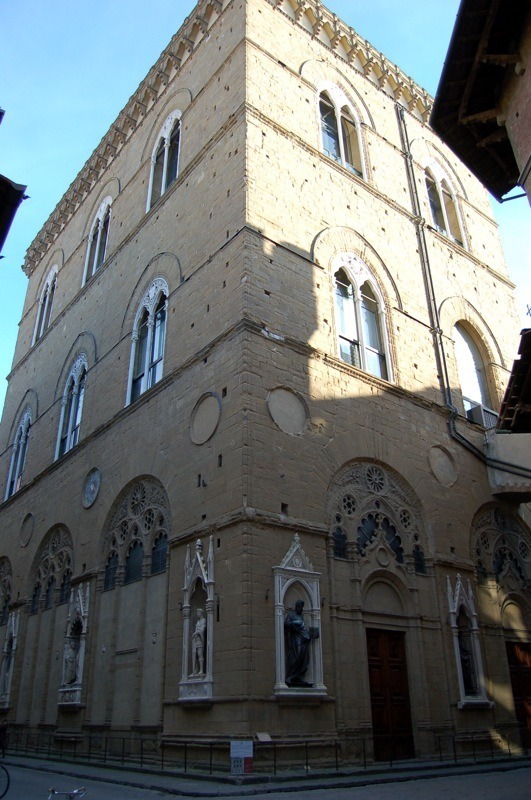 During the first half of the fourteenth century, Florence's crumbling market hall was torn down to make room for Orti San Michaelis (referred to as the Orsanmichele), a corn exchange and meeting place for the various guilds of Florence. Each guild was given its own niche and in 1339 all were asked to decorate their respective niches. The guilds, however, were slow to begin. The fifteenth century had begun before any work had even been commissioned. To speed the process along, the city of Florence issued an edict stating that if decoration of each niche had not begun within the following ten years, the offending guilds would have their niche confiscated and reallocated to another. With this in mind, the guilds finally got to work. Rivalries were intense as each wanted to have the most beautifully decorated guild, so competition for Florence's best artists was fierce. Lorenzo Ghiberti, Donatello's mentor, was quickly snapped up and commissioned to sculpt St. John the Baptist (see Related Sculptures below) by the guild of cloth finishers and merchants. In 1411, Donatello was chosen by the linen drapers guild to sculpt St. Mark as its niche decoration. He began work immediately, choosing to work with marble instead of the more expensive bronze. The contract indicated that the work had to be finished and in its place no later than November 1, 1412; however, as was often the case at the time, the deadline had to be extended. Donatello finished St. Mark sometime in 1413 and to his amusement, the guild members were quite critical of it. However, when the statue was unveiled, placed high up in its niche in the Orsanmichele, its elongated torso, shortened legs and oversized head were striking in their seemingly perfect proportions. St. Mark no longer stands in the Orsanmichele niche, however. Today it stands in an honored place in the church museum. A copy of St. Mark now stands in the original niche. Donatello sculpted St. Mark because he received a commission to do so from the linen drapers guild of Florence. 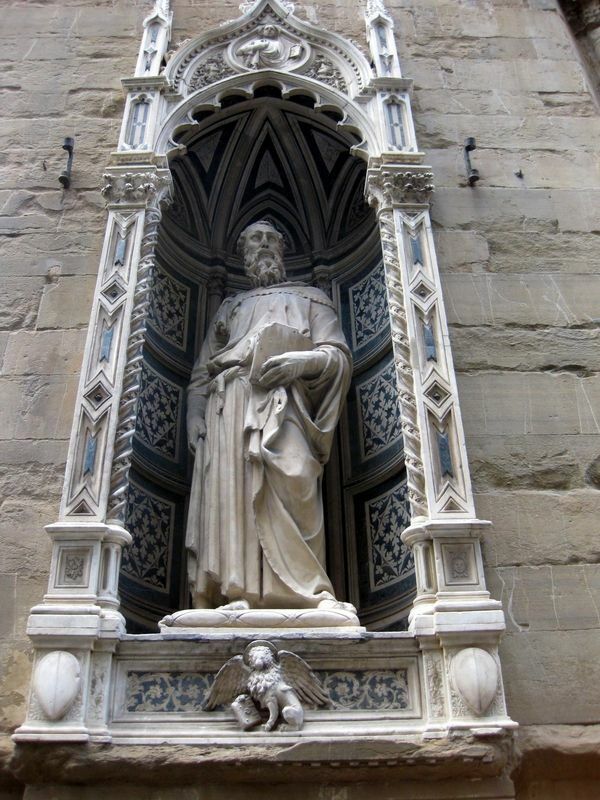 The statue was meant to decorate the guild's niche in the Orsanmichele, a corn exchange and meeting place in Florence. Donatello's exact reasons for choosing St. Mark to decorate the linen drapers guild niche in the Orsanmichele is unclear. St. Mark was a central figure in the life of Jesus and in the Bible; he was part of the original (and quite large) group of Jesus' disciples. He abandoned the group when Jesus informed them that as his disciples they would be required to eat his flesh and drink his blood. Not understanding that the words of Christ were a metaphor, he ceased his discipleship for several years. He was later restored to faith by Peter, one of Jesus' long-faithful disciples, and for a time his mother's house was used as a meeting place for Jesus and his disciples. Mark remained in the service of Jesus until his death, helping to spread the message of Christianity throughout the world. St. Mark is credited with founding the Church of Africa, the headquarters of which is still located in Alexandria, Egypt. Donatello's St. Mark, sculpted from marble, strongly reflects his devotion to the classical style. St. Mark stands in "contrapposto", or natural pose, his weight on one leg and his drapelike clothing revealing the body underneath it. Curiously, however, the leg bearing St. Mark's weight is invisible beneath his clothing. The other leg is bent, allowing the viewer to see the outline of a knee. 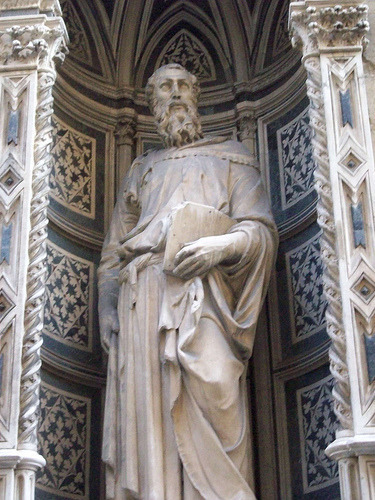 Because he knew the statue would be viewed from below - not at eye level - Donatello purposely elongated St. Mark's torso, shortened his legs and enlarged his head and hands. This made it seem proportionate when viewed from the proper angle. The realism that allows the viewer to get an idea of St. Mark's body beneath his clothing was popular during the Renaissance. Unlike his master's Orsanmichele work, Donatello's St. Mark is anything but idealized. St. Mark was the product of Donatello's ingenious merging of classical ideals with the tenets of the Renaissance. The statue's natural pose and very human face and body make it seem like it could walk out of its place at any time. It is even possible to view veins in the hands. Above all, Donatello's St. Mark reflects a change in artistic tastes: no longer was the highly stylized and unnaturally perfect international Gothic style the reigning artistic movement. It was slowly but surely making way for the individualism and realism of the Renaissance. Taking two years to complete, Donatello's St. Mark was regarded as a near-perfect embodiment of the artistic ideals that were emerging during the Early Renaissance. In fact, High Renaissance master Michelangelo said of Donatello's statue, "I've never seen a more convincing image of an honest man than this statue, and if the evangelist was like that I could believe everything he wrote". However, upon being unveiled to the guild its members were less than happy with the statue; they thought it aesthetically unpleasing because of its apparent lack of proportion and insisted that Donatello make adjustments. He argued that they were viewing it from the wrong angle, but they held fast. To pacify them, knowing that the statue would look perfect once it was properly situated in its niche, Donatello placed a cloth over the statue for two weeks and pretended to work on it. In reality, he did nothing. When it was placed in its niche and unveiled, the guild members were aghast at the changes and declared it perfect. The work most closely related to Donatello's St. Mark is probably his St. George, originally made for the armorers guild's niche at Orsanmichele in Florence. It features the same attention to detail and adherence to stark realism as the statue of St. Mark. Though it was not created for the Orsanmichele, Donatello's Mary Magdalen is equal to both the St. George and St. Mark in its striking emotional quality and meticulous detail. It is a freestanding statue crafted in the round and can be viewed from all angles, also like Donatello's two works for Orsanmichele. All three statues are evidence of Donatello's truly remarkable skill at creating life from bronze or marble. 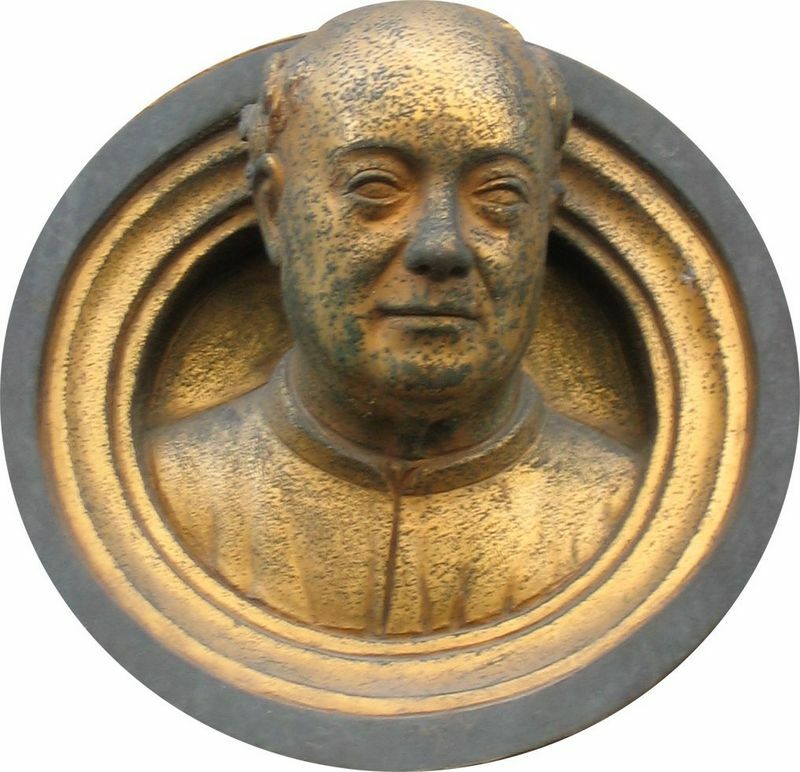 Donatello's master, Lorenzo Ghiberti, also produced a statue for the Orsanmichele, the St. John the Baptist, which was fashioned from bronze and created for the guild of cloth finishers and merchants. Donatello's St. Mark was commissioned by the linen drapers guild of Florence at the beginning of the fifteenth century. It was meant to be placed in the guild's niche at Orsanmichele, a corn exchange and guild meeting place that is today a church. The statue was completed in 1413 and placed as arranged in the niche, where it stood for centuries. Today, it can be found in the church museum and a copy of the statue stands in the niche where the original formerly stood. 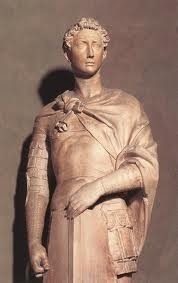 Donatello, a Florentine sculptor who lived and worked during the Early Renaissance, was born to a wool-carder in 1366. He was briefly apprenticed in a goldsmith's shop and then to Lorenzo Ghiberti. He soon struck out on his own to find his place in the art world. He met architect Filippo Brunelleschi in Florence and the two traveled together to Rome, where they worked - Donatello as a sculptor, Brunelleschi in architecture - and researched classical Roman art. Both had a tremendous influence upon the other, sparking a friendly rivalry and a long friendship. 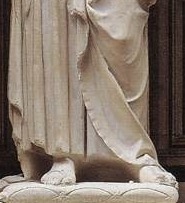 Donatello is best known for his merging of Renaissance ideals with classical techniques. All of his works are remarkable for their meticulous detail and strikingly natural appearance. Donatello preferred to show things and people as they truly were, not in the stylized form of the international Gothic movement (which was popular at the time). He won numerous commissions throughout his life and worked until the day of his death. A favorite of the de Medici family of Florence, Donatello was constantly working for them, helping to decorate the de Medici palace. St. Mark is one of the artist's most famous sculptures. 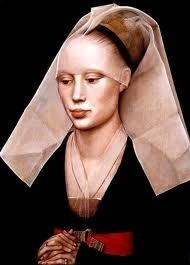 The Early Renaissance was a time of rather tentative artistic exploration. The international Gothic style still reigned supreme among most artists and many of them were uninterested in change or evolution. The previous century or so had seen slow movement toward a more realistic and natural approach to art, but real change was slow to come. Artists still clung to fairly uniform themes and techniques, not daring to risk unpopularity or rebuke for straying from what the public (or the church) wanted. 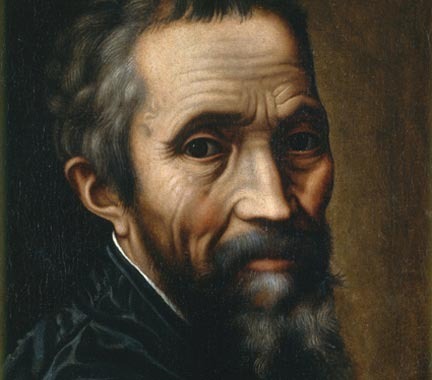 However, the period that eventually gave way to the High Renaissance was filled with beautiful art of various mediums and numerous great artists; Donatello, Lorenzo Ghiberti, Andrea Pisano, Brunelleschi and many others were among the talented men who helped usher in the age of true enlightenment. For further insight into the life and works of Donatello, please choose from the following recommended sources.